Walter Rauschenbusch is credited by many interpreters as the fountainhead of the social gospel in America. An American Baptist minister of German heritage, Rauschenbusch was the “prophet” of a movement that created a watershed in American religious thought. A theological educator, social activist, and church historian, Rauschenbusch is continually revisited a century after his death. This three-volume set makes available the original texts of a seminal thinker in an authorized and critical edition. 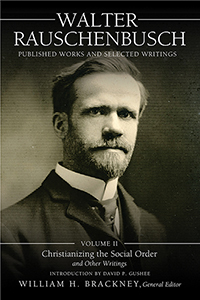 Volume II is oriented toward an ethical appreciation of the life and works of Walter Rauschenbusch. Ethicist David Gushee provides an in-depth analysis of Rauschenbusch’s ethics, tracing in particular the course of development of Christian ethics and Rauschenbusch's contribution. Included are Rauschenbusch’s major works, CHRISTIANIZING THE SOCIAL ORDER (1912), DARE WE BE CHRISTIAN? (1914), and THE SOCIAL PRINCIPLES OF JESUS (1916). Also included are shorter works, UNTO ME (1912), "Some Moral Aspects of the Woman Movement" (1913), and "The Greatest of These" (1913). A dynamic thinker, whose ethics reveal an evolving character from a strictly Biblicist method to his being influenced by Socialist thinkers, German historicism, American Progressive Era economics, and his own empirical observations, Rauschenbusch sharply critiqued western industrialism in light of the life and teachings of Jesus of Nazareth.